Honestly, sometimes, you just need a story that will bring a smile to your face. The kind of book that will have you turning the last page, closing the cover, clutching the book to your chest and saying, “That was so good.” To quote my initial reaction on Goodreads, “I just finished this book with the biggest grin on my face.” And it was the truth! You may be wondering what novel garnered this enthusiastic response. The answer? Shuffle, Repeat! The story is centered on June, a gal with a strong personality who is eager to get out of high school and into the real world. She recently moved with her mom to a different neighborhood, one that puts her within a couple minutes driving distance from her mom’s best friend’s family and results in her carpooling with Oliver, who is her mom’s best friend’s son. The two of them initially appear to have no common ground, but after a few conversations and a couple of musical encounters, it turns out that they actually get along really well. The whole novel not only explores their budding friendship (and perhaps romance), but also portrays the life of a senior in high school (including personal and familial aspects). But apart from great characters, as well as just the right amount of humor and heart, I loved that Klein manages to capture the feeling of being a high school senior. She really wrote it in a way that I ultimately connected to, taking me back to that time of my life where all these things – high school traditions, friendships new and old, the remaining few days of high school academics – really mattered in a different way. That time in my life, while I only remember it in snatches now, is extremely special to me, and I think that Klein really managed to ace her portrayal of that time. 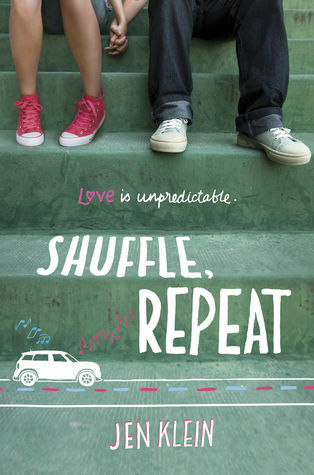 Basically, in case you couldn’t tell, I fell head over heels in love with Shuffle, Repeat. It was so cute, so funny and so well-written, and I would highly recommend checking it out for yourself!